Four-times all-state, a Ms. Hockey Award, two national titles, and a successful career for Team USA are just some of the accolades Ashley Albrecht racked up during her storied career. The South St. Paul 2002 graduate helped lead her high school team to their first state title in 2002 where they beat White Bear Lake 2-1. After winning the Ms. Hockey award, Albrecht went on to help lead the Golden Gophers to consecutive national titles in 2004 and 2005. A stay at home defenseman, Albrecht has proven that she wins with whatever team she plays on and will go down as one of Minnesota’s most decorated hockey players. 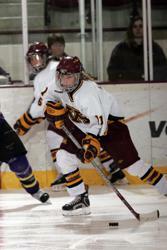 Lee Stecklein has a combination of size and skill that is virtually unmatched in Minnesota girls’ hockey lore. After an illustrious career at Roseville High School, Stecklein went on to star for the University of Minnesota. How good was she? She had a plus/minus rating of plus-137 during her career. She was a three-year captain as well and was drafted second overall in the 2016 NWHL draft. Stecklein was also an integral member of the 2018 Olympic gold medal-winning Team USA. 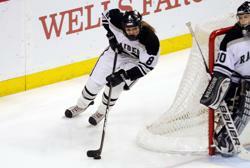 She currently plays for the Minnesota Whitecaps and was named captain of the NWHL All-Star Game. Dani Cameranesi burst onto the hockey scene as a freshman for Blake School where she tallied 33 goals and 32 assists in her first varsity season. She followed that up with seasons of 71, 59 and 81 points, scoring an astounding 49 goals her senior season in which she led Blake to the state title. After graduation she went on to star at the University of Minnesota where she kept her torrid scoring pace with 93 goals in four seasons. She then went on to help lead Team USA to a gold medal at the 2018 Winter Games. Chosen third overall in the 2016 NWHL draft, Cameranesi is currently playing for the Buffalo Beauts. Gigi Marvin’s career is well documented. The Warroad native grew up in Hockeytown USA and emerged as one of the best pure talents the state has seen. At Warroad she was a three-time all-state player and amassed an incredible 112 points including 55 goals her senior season. When all was said and done she had scored 196 goals and 425 points during her high school career. In 2005 she was named Ms. Hockey and went on to star at the University of Minnesota, scoring 195 points during her career. 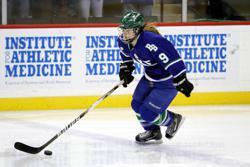 She has continued her career in the NWHL, playing for the Minnesota Whitecaps and now the Boston Pride. She was also a member of the historic 2018 women’s Olympic team who took home gold. Roseville Area High School has produced an astonishing number of elite girls’ hockey players, and Renee Curtin was certainly one of the best. As a seventh-grader in 1996, she led the Raiders to their first ever state championship, scoring five goals in two games at state to earn all-tournament team honors. Curtin repeated that feat the next three seasons, helping the Raiders to a consolation title in 1997, a third-place crown in 1998 and another state championship in 1999. She closed out her high school career as a five-time all-state honoree and the 2001 recipient of the Ms. Hockey award, amassing a state record 544 career points, including 61 goals in her senior season. She headed to the University of Minnesota to play college hockey, but she wasn’t medically cleared to play after a neck injury suffered in high school didn’t heal properly.